Hi! 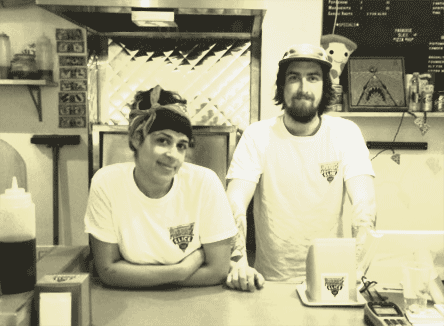 We’re Noura and Dan, owners of Paradise Slice, an independent start-up business with a real passion for proper New York style pizza! With a combination of classic toppings and rotating specials, there really is something for everyone at Paradise Slice. Nestled amongst the curry houses of Brick Lane, we are bringing a “slice” of the Big Apple to East London. We make massive 20” pies, that are available whole to take away (if you make it out the door!) or by the slice – a large snack or a mix-and-match meal of more than one! Whether you eat in the restaurant or take away, we also offer a great range of beers that run from the exotic to the familiar, from the US and Europe. Our ingredients, recipes and specialist techniques have been carefully chosen to bring you the authentic taste of real New York Pizza in London – we challenge you to find a closer match! Our dough recipe has been tirelessly tested to ensure that you are getting the real New York “slice joint” experience when you eat with us. After living in New York for 12 years, Noura, a native Londoner decided to come back home, but not before cultivating a serious passion for finding the perfect slice. Unfortunately, she hadn’t figured on how woven into her life the street corner slice shop had become during her time away. When she returned, it became clear that something had to be done. Her desire for the perfect slice with Dan’s 10 years of hospitality experience, the two embarked on the crazy project of opening their own shop. To make our pizzas extra flavourful and with that elusive balance of crisp and chew that is the signature of the New York slice, we use a two-part fermentation method that takes a minimum of 70 hours before its ready to go anywhere near the oven! This allows our dough to really develop and enhance the flavours created naturally during the fermentation process. We pride ourselves on only ever using the freshest quality ingredients to make our pizzas. We use flour that is UK milled from UK grain, and traceable Italian cheeses. We make everything fresh throughout the day, by hand and in-house, working hard to bring you a slice of Paradise! View our menu including daily specials!